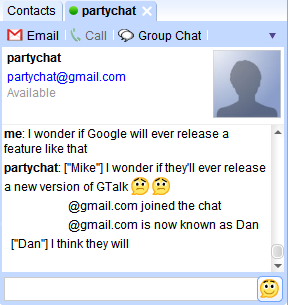 PartyChat adds one of the many missing features from Google Talk: chat rooms. You need to add partychat@gmail.com as a friend and use commands to create a room or join an existing one. To make sure nobody joins your room accidentally, password-protect it. PartyChat is like a group chat, except that it's less obtrusive and persistent across different login sessions. For example, say your friends are in a party chat named "drivel". To enter the chat, IM partychat@gmail.com with the line "/enter drivel." After that, you'll receive messages sent in "drivel" from partychat@gmail.com and all messages you send to partychat@gmail.com will be broadcasted to your friends in "drivel." If you log out of Google Talk and then log back in, you're still in the party chats you were in prior to logging out. To leave a party chat, IM "/leave" or "/exit" to the address you were chatting with (e.g. partychat@gmail.com). PartyChat is an open-source project created by a Google employee: Akshay Patil in December 2005, not long after Google Talk was released. Since then, Google Talk didn't add too much features. Only Google Talk's gadget has an option for group chats, while PartyChat can be used in Gmail Chat, the desktop client or any other Jabber client. /create chat_name [optional_password] - creates a new party chat. If you provide a password, then other users must give this password to enter the chat. /join chat_name [password] - join an existing party chat. If the chat has a password, you must give the password to enter. Why did this take so long to become known? Most people who haven't joined me on Google Talk only wanted group chat and with this it works. I am so getting more people into Gtalk now. Oh yeah! I apologize. I knew about PartyChat since last year, but I forgot to write a post about it. I wish there were some commands to invite people into your chat. Well, you can send them a message. Does anyone actually knows why Google hasn't integrated proper group chat. It seems really weird that it's missing from window client. Anyone knows how to change or delete the password from a group I created? Is this possible? Has anyone determined a way to get a list of available rooms? I would also like to know how to get a list of available chat rooms? This is awesome. We have a local radio station that has a lot of listeners that use Gtalk and this is cool for a full on chat with other listeners.